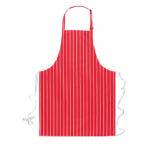 Polycotton bib apron. Bleach resistant vat dyed fabric. High spec fabric. Antiâtangle ties. Tie tapes bar tacked, ends turned and sewn. Denny's label sewn flat. Suitable for industrial laundering at 65Â°C. Please contact us on 021 4705088 or sales@atozsafetycentre.ie for more details. 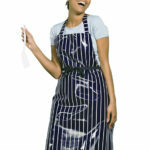 Anti-bacterial waterproof PVC coated striped apron. No pocket. Anti-tangle ties. 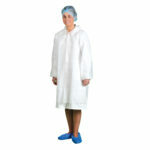 Anti-bacterial coating to allow low temperature hand wash. Hand wash. Halter with invisible adjuster. Please contact us on 021 4705088 or sales@atozsafetycentre.ie for more details. 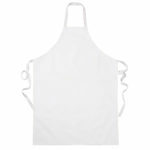 Ideal for food preparation and lab work, this generously sized apron provides limited splash protection for partial body in accordance with EN13034 and EN1149-1 anti-static protection. 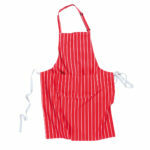 DISPOSABLE PE BIB APRON &..